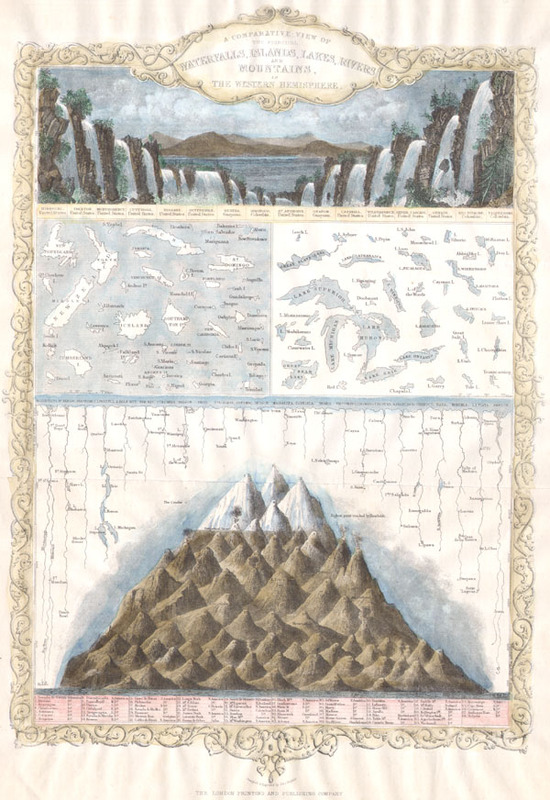 This is Tallis's c. 1850 chart of comparative geographic features for the Western Hemisphere. Shows the islands of New Zealand, Cuba, Iceland etc., the Great Lakes and others, the rivers Mississippi, St Lawrence and Amazon and the mountains with the highest given as Nevada de Sorata, South America. This particular chart was likely not issued with Tallis' Illustrated Atlas. Given its double fold lines, it is safe to assume that this map was issued to illustrate a book or other text. This chart was designed and engraved by J. Rapkin. Published by the John Tallis & Company, London & New York in 1850. Very Good condition. Original fold lines. Blank on verso.